As the population ages and moves into retirement, financial planning and estate planning are becoming the number one concern of many Canadians. Investment Advisors and other financial professionals may find themselves confronted with a number of questions from their clients seeking answers. If you are an investment advisor or other financial professional looking for an income tax quick reference guide or a financial planning reference guide, I have two such books to recommend. The first is a book many investment advisors may already be familiar with: KPMG’s Tax Planning for You and Your Family. This book has been a mainstay in the Canadian market place for many years and has been included in many courses in the investment and financial planning industries. Updated for 2009, Tax Planning for You and Your Family is a comprehensive pocket reference, indispensable to any advisors library. Small enough to carry in your brief case yet packed full of common and useful hints, tips, and advice. The 2009 updated version of Tax Planning for You and Your Family is available from chapters.indigo.ca . The second book is, in my opinion simply the best income tax reference book available. Tax Guide for Investment Advisors has everything an investment advisor should know or could be asked by their clients. Written specifically for investment advisors, this book covers the taxation of almost every form of investment. Investment instruments, investment income, special investors, tax-advantaged strategies, and registered plans are dealt with in depth. In addition, each topic is cross-referenced and relevant CRA forms and bulletins are listed in each chapter. This book is a must for any investment advisor. 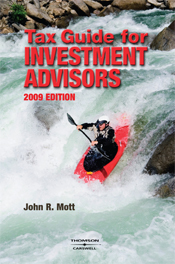 The 2009 version of the Tax Guide for Investment Advisors is also available from chapters.indigo.ca .